The late Muhammad Ali’s incredible life comprises so many different eras. There’s the brazen, self-described “pretty” young boxer – previously known as Cassius Clay – who burst onto the boxing scene and enticed audiences in the early 1960s with the sharpness of his wit as well as his quickness in the ring. Many factors came together to credit Muhammad Ali as “the greatest” boxer in history. He grew in popularly regarded as a champion of the oppressed and a seeker of justice for the victimised. Vital to the celebrity Ali achieved, however, was his brilliant ability as a boxer. Various boxing pundits have ranked Ali as the best ‘heavyweight’ boxer in history. Along with the legendary Sugar Ray Robinson, they have been paired as the top two across all weight divisions. Ali won a gold medal (as a light heavyweight) at the 1960 Rome Olympics as the result of an amateur boxing career in which he won 100 of 105 bouts. Professionally, Ali won the world heavyweight championship on 3 separate occasions over 14 years. He has won in 56 of 61 professional bouts, with three of the losses coming late in his career when his athleticism had diminishing. Ali was never seen as one of boxing’s hardest hitters and over a third of his professional contests lasted their complete scheduled duration. Nor was he differentiated in terms of height or weight. Instead, Ali’s speed, agility, footwork and overall athleticism the main attributes that most distinguished him from his opposition. It was said he was a heavyweight who moved like a lightweight. In the early years of his career, Ali also displayed exceptional aerobic endurance: he was able to persistently maintain his dancing, up-on-the-toes style. Ali was undoubtedly uniquely gifted. But he utilised techniques that, while clearly effective, were far from classical. In contrast to modern views of best practice, he often held his hands by his sides at waist level, and he sometimes avoided the punches of opponents by moving his head backwards away from them. Many boxing experts regarded these as high-risk behaviours made viable only by Ali’s astonishing speed, but the abnormality in style served to confuse his competitors and bait them into errors. He was seldom the antagonist, favouring a method that exploited the aggression of others. Ali personally characterised his own style as “float like a butterfly, sting like a bee”. His distinctive, unconventional boxing style was in keeping with the fierce individuality and denial of norms that permeated other aspects of his life and created almost universal interest in him. Ali also demonstrated major psychological strengths. He was renowned for his self-belief, which frequently extended beyond vociferous pre-contest expressions of confidence to actually nominating the very round in which he would win. He was predisposed to composing rap-style poems designed to extol his talents and unsettle opponents, and was well-known for his frightening stares and for subjecting opponents to verbal taunts during bouts. Over time, Ali’s perennial competitive success seemed increasingly to justify the self-belief and enabled him to inculcate an impression that he was almost superhuman. That was an impression that a public seeking new heroes in turbulent social and political times was very willing to accept. In addition, it appears to have been embraced by Ali himself. The self-belief and impression of superhuman qualities were arguably instrumental in allowing Ali to get through a number of torturous fights. These included the “Thrilla in Manila”, where he and Joe Frazier inflicted shocking damage on each other in what he later described as a near-death experience, and the “Rumble in the Jungle”. In the Rumble in the Jungle, Ali absorbed some massively forceful punches from George Foreman as part of a contrived “rope-a-dope” strategy. This eventually brought him an unlikely victory that proved to be the crowning glory of his incredible boxing journey. 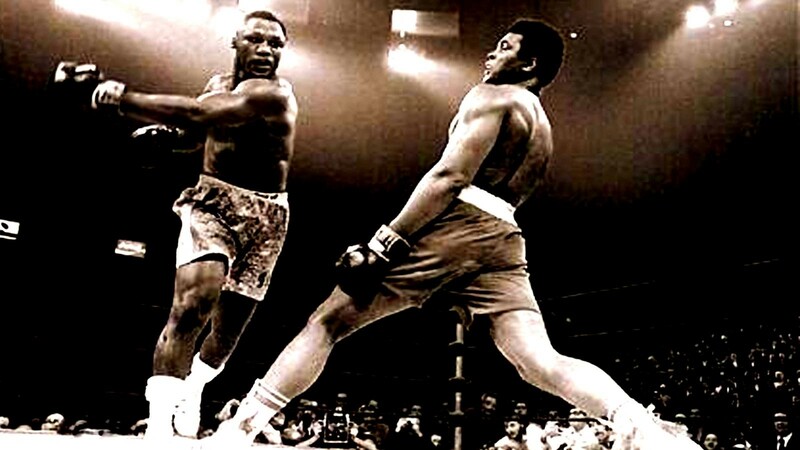 In the phase of his boxing career, after his 3½-year suspension from the sport due to his refusal to enter the US Army & Armed Forces, Ali became well-known for his extraordinary ability to “take a punch”. This – along with the courage and commitment to purpose that it implies – has been considered as another reason for his boxing greatness. The taking of punches, though, very likely had a significant downside in causing neurological injury and contributing to the Parkinson’s disease that affected his life from the mid-1980s onwards and was soon greatly debilitating. Ali not only competed during the “golden years of heavyweight boxing” but was the fundamental reason for them. He brought completely new dimensions to the sport and gave it a sort of aestheticism and a broader relevance that was without precedent. Despite the health problems that he suffered in retirement, he reportedly continued to enjoy being Muhammad Ali. That enjoyment was well-earnt. He inspired and empowered multitudes of people around the world and engendered cultural change. Ali’s passing has evoked widespread sadness, particularly among the many admirers who somehow identified so strongly with him that they felt a quite intensively personal sharing of his triumphs and defeats, both in the ring and outside it. He leaves an enduring and highly influential legacy, which in the final analysis has been made possible by the qualities that made him genuinely “the greatest” as a boxer. Welcome to the online space for African Ring. We are dedicated to covering all the latest news and events in the world of South African boxing. African Ring is solely owned and run by Jeff Ellis. Jeff Ellis’s participation and commitment to the sport of boxing is well documented. He has acquired a formidable background regarding boxing through years of commitment, participation and passion for this sometimes brutal yet gratifying sport. Having participated at all levels of the sport (as a boxer, trainer, publisher, matchmaker, promoter, official and International Fight Commissioner) his wealth of experience has certainly complimented the formation of African Ring. 1959 was the year Jeff had his first ring experience, winning a decision and along with it a small trophy: his then prized possession. From that moment he was hooked. Today his collection of boxing photographs, which runs well into the thousands, is his prized possession. African Ring, Jeff’s publishing company, is the sole publisher for Golden Gloves (Pty) Ltd souvenir boxing programs.